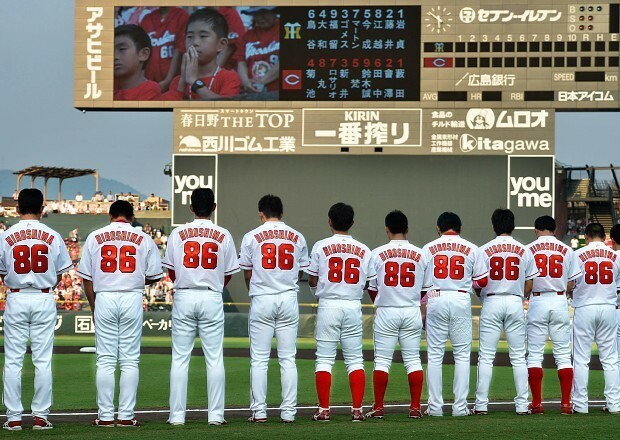 HIROSHIMA -- On Aug. 6, Hiroshima Toyo Carp players commemorated the atomic bombing of the city 70 years before by all donning the uniform number "86" in a game against the Hanshin Tigers, looking to pass on the story of the bombing to younger generations. The game was the first ever in Japan's Central League where every player on one team wore the same number. The baseball club planned the project because growing numbers of local children do not know an atomic bomb was dropped on their city on Aug. 6, 1945. Hiroshima Carp players and other members of the club wore uniforms emblazoned with the word ''Peace" on the front and "Hiroshima" on the back, and a cap depicting a white dove as a symbol of peace.